Believe it or not, we at Brewery Creek love more than just our beer. We enjoy many craft made spirits as well. One that has recently been peaking our interest is bourbon. This drink has an odd name and weirder descriptions, like: “all bourbon is whiskey, yet not all whiskey is bourbon.” We set out to clear up the drink’s requirements, history, and best methods of enjoyment. 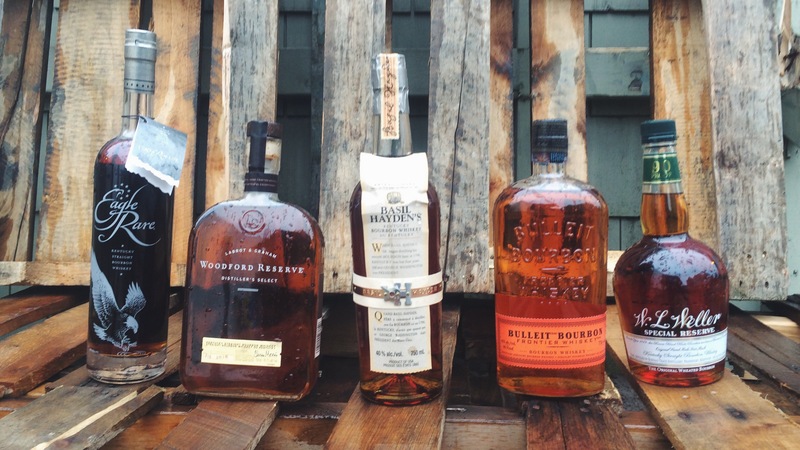 So what exactly makes bourbon stand apart from its’ old world relative, whiskey? Well, first and foremost it has to be made in the United States. While most of the production and history is concentrated in Kentucky, it can be made anywhere in the US. Additionally, the grain bill used needs to contain at least 51% corn and it has to be aged in charred, virgin oak barrels. Other rules apply but these are the main requirements to be called Bourbon. As with most rules, they came to be gradually over time. Kentucky is widely regarded as the birthplace of bourbon and rightfully so. The area is known to have really good limestone filtered groundwater that is generally free from iron. This makes it great for distilling. Given the nature of the climate in the area, corn was much more abundant and cheaper than other grains such as barley, wheat or rye. This made it a sensible choice to have a high percentage of corn in the grain bill when distilling. Barrels came to be used mainly for transport at first. Since many distilleries were historically fairly small operations, they found it cheaper to buy barrels second hand that were originally used to transport preserved foods such as meat and fish. To get rid of the pickled character in the barrels they would char them on the inside. Unbeknownst to them at the time, this created a red, caramelized layer just underneath the char where much of the sweetness of the oak got concentrated. This, along with the hot weather in the area, caused a neat effect in the barrels. The wood would absorb and expel the liquid inside throughout the hot/cold cycle of the day and night. That in turn would create, and extract, much of the flavor we now know and love in bourbon. And so, bourbon was born! As popularity increased, many producers switched to newly charred, virgin oak to create consistency of flavor. Nowadays, the general process starts with a proprietary blend of corn, rye, wheat, and barley that is milled and soaked in water and has yeast added similar to the initial stages of beer making. This starts a fermentation that usually lasts 3 days to a week, this mixture is transferred to a pot or continuous still where it is distilled. Most of the time it is distilled twice to increase the alcohol percentage and to create a cleaner finished product. At this point, the clear distilled liquid is called “white dog.” This is what ends up in being aged in the barrels to create bourbon. All this is a fairly regimented and regulated process. So how does one create their own distinct bourbon? Much of this comes from the grain bill blend they use at the start. Of course, the majority is corn. This gives it a certain sweetness that is the signature of the style. Barley is also a necessary grain because it contains enzymes that help convert the starches in the other grains to sugar during the initial fermentation. It also lends a bit of biscuity character. The next two grains, rye and wheat, contribute mostly to flavor. Rye has an intensity that many people enjoy. It brings the “bite” so to speak. Think peppery notes with a punchy finish. Wheat on the other hand, is much softer in character. It is more open and allows things like the sweetness and the vanilla character from the barrels to show through much more. Most distillers’ recipes are closely guarded secrets that only a few individuals really know. Time spent in barrel will also contribute greatly to the flavor and price of the bourbon. The longer the time, the greater complexity and depth the bourbon will have. As you can see, a lot of work goes into making bourbon. Now, how should one enjoy such a spirited beverage? Many purists enjoy it watered down a tad or over some ice. It brings down the alcohol percentage down a bit and helps showcase the unique flavor of the bourbon. That’s right, neat isn’t always best, especially with bourbon. There are also many cocktails where bourbon really shines. Think of classics such as the Old Fashioned or the Manhattan. The Kentucky Derby even has an official bourbon cocktail known as the Mint Julep which is an excellent, summer drink. Bourbon is very versatile in this department. All in all, bourbon has a picturesque and storied history that is integral to the nation that created it. Surely you might pay a bit more for the average bottle of bourbon as opposed to a whiskey, but know that the quality of what you pay for much outweighs other whisky products. Remember: Every drink is an experience. Happy bourbon hunting!